If you are a driver, rider or caravaner, the glorious highways and backroads of New South Wales’ New England region are calling you. Who knows what you’ll discover? When I first started driving around the country not long after I earned my licence, there wasn’t a lot to see along the way. Or that’s what I thought. Service stations dished up ‘burgers and steak sandwiches washed down with ‘truckers’ blend’ instant coffee or maybe a Coke. The mission was to get from A to B - via C and D - and ASAP! Nowadays I take an extra day or two, enjoying a more leisurely tactic and visit the many sights I frequently hurried past in the old days. You’d be surprised what you unearth. On the Sydney to Brisbane run, I would avoid the white-knuckle Pacific Highway at every opportunity and discovered some glorious countryside all through the New England High Country from Bellingen through to Walcha and Gloucester on the rugged Thunderbolt’s Way. This time I have the opportunity to investigate more thoroughly. With no deadlines or need to rush, I’m going to have a jolly good look at the towns that were once just a blur or a fuel stop, meet some locals and hear some stories. Now, if you are planning an adventure like this you should know that pretty much any vehicle will get you around these highways and byways. Load up the SUV, tow a caravan or do what I see many more people do than ever before and get on a touring motorcycle. 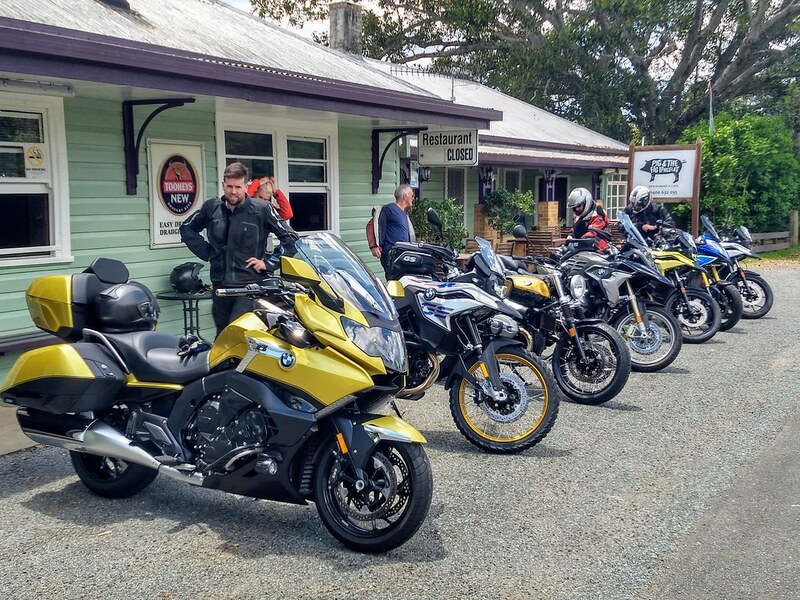 Accessing the New England High Country is easy from either Sydney or Brisbane and even Adelaide and Melbourne have direct routes across the country, so there is no excuse to miss out on some fabulous riding and driving roads with plenty of opportunities to stop and take a closer look. 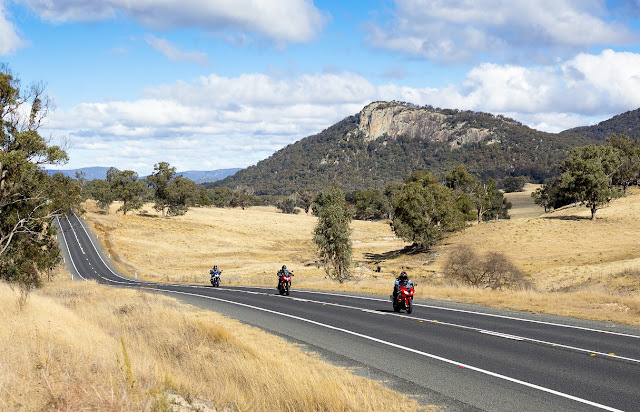 One perfectly sensible way to explore is to pick one of the main centres such as Armidale, Tamworth, Glen Innes or Inverell as a hub and conduct loop tours, with or without overnight stops mid-cycle. This way you can gather up most of the prime attractions at an easy pace and still enjoy lots of poking around should the occasion arise, and believe me, it will. To help you decide here’s a bit of a run-down of what some of the towns offer and what you can see in between. A darling village of around 1500 folks with a few surprises to boot. Ideally located at the junction of Thunderbolt’s Way and the Oxley Highway, you can head off in any direction for a super drive. This is a popular location for motorcyclists as both these roads are sought-after routes for serious riders. Not so much if you are towing a caravan, perhaps. In town, the ultra-quirky former Royal Hotel is now a boutique guest house and favoured rest point for weary riders. Full of whacky ‘salvage’ art and motorcycle memorabilia it’s a fun stop for sure. 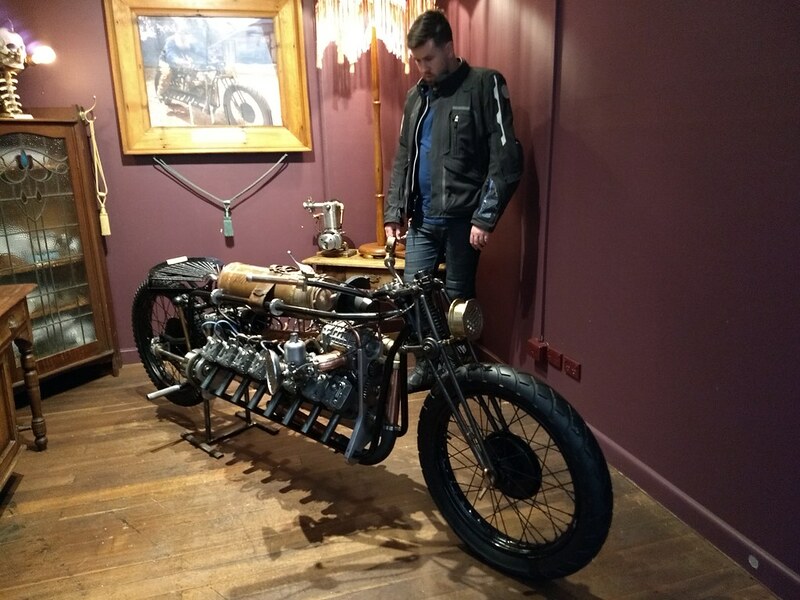 Great meals can be had at the Commercial Hotel, off the main way, and you will be astounded at the Antipodian Tynker, a bespoke steam punk store with the most amazing hand-built motorcycles. Yes, hand built. Wait till you see the supercharged V16 made from Victa lawnmower engines. Un-freaking-believable! This town is the centre of the Captain Thunderbolt legend, home to a thriving artist community and chock-a-block with heritage-listed properties such as the McCrossin's Mill Museum (where the bushranger’s tale is told), the old railway station and the New England Brass and Iron Lace Foundry. Like the infamous Ned Kelly, Fred “Captain Thunderbolt” Ward was a lawless highwayman given to robbery and violence and met his end at ‘The Rock”, another heritage-listed site south of the town, along the New England Highway. Even with Thunderbolt long gone, it is easy to get waylaid here with all this fascinating stuff and if you’re peckish, the modestly titled Michael’s Cafe has a yummy assortment of backed-in-store pies. Also near Uralla: The picturesque All Saints' Church at Gostwyck, east of the town. This famous university city of around 25,000 could well be called New England’s capital and is something of an urban microcosm with a very bragworthy art gallery, the New England Regional Art Museum (NERAM). It’s home to the coveted Howard Hinton Collection, a assemblage of iconic Australian Art from the period 1880 to 1948. There’s quality accommodation all over town, like the Powerhouse in Marsh Street, and decent tucker too at the White Bull, especially if you love a good steak. When the driving is done, sample some of the local craft beer at the hip Welders Dog microbrewery. The stout and bown ale are my pick. If you need to stretch your legs, there’s easy hiking at Mount Yarrowyck Nature Reserve, where some Aboriginal rock art is also preserved. Also near Armidale: The National Trust property, Saumarez Homestead, is a fascinating example of a fully furnished Federation Edwardian 30-room manor house with all its original fittings. Getting close to Queensland is this large town of around 12,000 citizens. It can chilly up this way, so have some woollies at the ready or buy some locally at any of the craft shops. For my money, the most entertaining attraction is the National Transport Museum with more than 120 vehicle exhibits comprising vintage, veteran and classic cars and motorcycles. You’ll find a few dinkum Aussie cars that dad had in the garage as well as one of the rarest cars in the world, the last remaining 1906 Dayton. And if things made from wood enthral you, check out some of Rob Day’s timber curiosities at New England Woodturning Supplies. If you can work out what an Oddgeridoo is, please let me know. Also at Inverell: Fossick for sapphires around the river or visit the Pioneer Village with its collection of preserved mid-19th-century historic buildings. Yes, you can sing along with the ghost of Peter Allen to that well-known tune while you visit the famous saddlery of the same name. What you may not know is that the song is dedicated to Allen’s much-loved grandfather, George Woolnough, who worked at the saddlery. His picture and many of his old tools are still there. Tenterfield is also known to some as the birthplace of Australia, following Sir Henry Parkes’ famous 1889 speech that propelled the colonies to Federation in 1901. You can visit the spot at the Heritage-listed School of Arts in Rouse Street. Also in Tenterfield: Glenrock Gardens is a spectacular and award-winning country garden. Check first for opening dates and times. You’ll no doubt have heard of the famous standing stones, a modern recreation of the ancient monuments that pay tribute to the Celtic heritage of the early European settlers up here. If you really want to find out who these folk were, go see the Land of the Beardies Museum located in the old hospital (next to the new hospital). You can easily spend a couple hours here reminiscing over many of the old (and not so old) artefacts on display. Some, I’ll bet, you still have at home in the shed. Importantly, it tells the story of the shire and the long-bearded stockmen, Chandler and Duval, who developed the area for raising cattle. Also near Glen Innes: The Emmaville Mining Museum, about 50kms north. Now that we’ve done our big lap of the New England High Country, you will have seen many places we missed. This can be your challenge to fill in the gaps, but I’ll give you these hints. The Bruxner Highway from Tenterfield to Casino is a glorious drive, although can get busy in peak holiday times. The Gwydir Highway from Glen Innes to Grafton is another popular drive with plenty to see and do. Or you can put on your explorer hat and take the Old Glen Innes Road (unsealed) that runs to the south. Armidale to Bellingen along the well-trafficked Waterfall Way is a sensational drive, but take it easy as the scenery will be trying to distract you at every turn. Take a break at Ebor Falls.